As far as Couture shows are concerned, Atelier Versace is my favourite to see. I'm always excited to see what Donatella would bring to the table each couture season. I absolutely adored the last show she did, which was inspired by romance and fairytale dreams, it was so refreshing to see from a Versace collection. This time around, she had included a more athleticism feel, which was evident in the first few looks that graced the runway. Perhaps something I wasn't expecting from a couture collection, especially when comparing it to the last, but as the looks went on I was more and more drawn in into the beautiful creations she had designed this time around. The collection was sure to draw attention to the formation of the woman body, and emphasis every curve you can. If any fashion house can do this to perfection, it is of course Versace. Of course her last SS16 collection was remarkably casual and leisurely, so it was great to see that Donatella had embraced the theme of the Rio Olympics this 2016, and actually carry on this muse into couture. A challenge to say the least, but she definitely nailed it. Nethertheless, the typical cut-outs, embroidery, bling, slits and plunges from Versace were on display, giving us the Versace we all know and love. The colour palette was relatively limited. The majority of the collection was white with pops of colour allocated onto the shoes, ropes and cut-outs. She was really embracing the summer theme by incorporating white but she did contrast this in the middle of the show with deep black pieces set off by pops of colour. 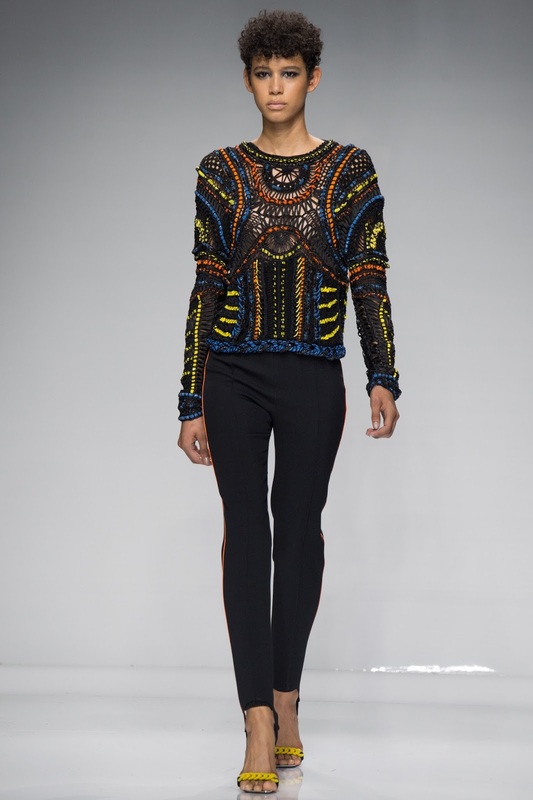 There was so much geometric aspects to these looks which added to the interest of the entire collection. Complimented with twists of rope, grazed in Swarovski crystals. It truly was a beautiful collection. Donatella herself stated that this collection, and the work on the show was some of the most time-consuming she has ever come up with - and I think this determination and effort was evident within this collection. I feel that she is always so enthusiastic to include new techniques on her designing routines to create the best collection for Versace to date. Of course, as we all want and love from Atelier Versace, the beautiful evening, red carpet, A-list worthy gowns made an appearance and rounded the collection off perfectly.